Frozen, co-directed by Chris Buck and Jennifer Lee, has all of the hall marks associated with a classic Disney production – there are princesses, comedy sidekicks, lessons to be learned and soaring songs which write themselves into legend as soon as they are heard. Yet, what separates Frozen from many of it’s contemporaries is nothing less than its vaulting ambitions as a piece of story-telling – it takes what an audience knows and expects from classic Disney, builds upon it, subverts it and updates it pleasingly and delightfully. A loose reworking of Hans Christian Anderson’s “The Snow Queen”, Frozen tells the tale of two Scandinavian princesses Anna (Kristen Bell) and Elsa (Idina Menzel) who enjoy nothing more than having fun in each other’s company. Elsa has been blessed (or perhaps cursed) with the ability to produce snow and ice from her hands; a cause of fun for a while, but when Anna has an accident (and all of her memories erased), Elsa becomes guilt-stricken and withdrawn. Anna is heartbroken and anxious to know why her big sister no longer wants to play with her any more, and Elsa is scared into secrecy – her burden is to hide who she is, and what she feels inside, in the belief it will protect those closest to her. Their relationship is shattered by the secret and, in one moment of subtle melancholy, when the sisters are reunited at a formal occasion they struggle to make small talk – although it is clear they still love each other, it’s hard to argue that the two really know each other any more at all. Having tried to conceal her ability to conjure ice, Elsa is tragically outed at what would have been her coronation as Queen – a fit of anger casts the kingdom into a permanent state of snow and ice. Ashamed and startled, Elsa runs away to start a new life alone and it’s inevitable that the one person who will risk everything to track her down is her little sister; she does not judge her elder sibling but cares for her unconditionally. They may not build snowmen together any more but, underneath it all, there is a love which can never be extinguished. Anna begins her quest to find Elsa, despite her lack of aptitude for the climate, and soon discovers some companions to help her along the way – the goofy but handsome Kristoff (Jonathan Groff), his trusty moose and a snowman, Olaf (Josh Gad), who pines to know what summer will be like. As with all Disney classics, there’s song and romance along the way but, pleasingly, at it’s heart, this is a film centred on the relationship of two young women who yearn to know each other whilst discovering, and accepting, their selves too. Whilst some may knock the traditional Disney princess as two dimensional and unobtainable role models for young girls, Frozen delightfully shows it’s leads as troubled and far from perfect – it’s characters, despite being hand drawn and with fictitious magical powers, are closer to the you or I we feel inside our souls than is often seen on screen, and for that (and so many other reasons), Frozen is a small wonder worth a thousand more “mature” middle-brow films which are likely to be lauded come awards season. Although Elsa’s plight as a princess who can create ice from her fingertips may sound not entirely easy to relate to, her story of solitude and trying to hide who she really is must be unbearably relatable to those who have ever had to deal with something alone and afraid. Whether it’s trying to hide depression to not worry those you care about, or fear of coming out, or even those who are encouraged to not disclose any traits which veer too far from the accepted neuro-typical, I’d suggest that we’ve all, at some point in our lives, known what it’s like to be confused and scared – we can all empathise with, and feel for, Elsa’s heartache. It’s a bold piece of characterisation by Disney, a company whom many associate with outlandish saccharine fantasy, to put such complex and close-to-the-bone emotions in their latest blockbuster but, in doing so, they’ve created one of the most human films of recent times. And certainly one of the most beautiful. For added bonus points, Olaf is perhaps the most entertaining comedy sidekick in Disney’s history (his show-tune about warmer seasons, “In Summer”, is as whimsical a song as you’ll ever hear) whilst “Let It Go” (as performed by Broadway legend Idina Menzel) seems destined to win best original song at the Oscars this year. The soundtrack is dazzling and the “Do You Want to Build a Snowman?” scene may well go on to rival the montage sequence in Up as one of modern movies biggest tear jerkers. 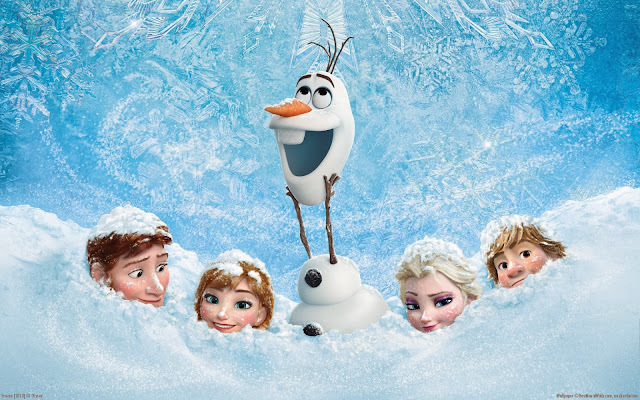 Nothing short of a modern classic, Frozen is one of those rare films worth melting for.